The Bluegrass occupies the northern part of the Interior Plateau, in Kentucky and parts of southern Ohio and southwestern Indiana. The Bluegrass is bounded on three sides by the Knobs, a necklace of hills formed of shale and sandstone capped by limestone. To the north, in Ohio and Indiana, the Bluegrass ends abruptly at the transition to the glaciated region that created the fertile farmland of those states. The Bluegrass is divided into three ecoregions, the Inner Bluegrass, the Hills of the Bluegrass, and the Outer Bluegrass. The woodland pasture habitat of ancient trees is found in the Inner Bluegrass and Outer Bluegrass. The Bluegrass covers an area of 10,500 square miles (27,000 square km), of which more than half is in the Outer Bluegrass. 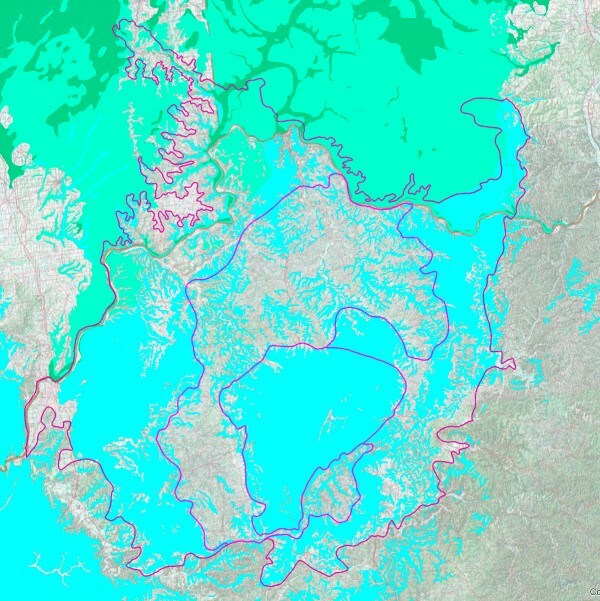 The entire area is unglaciated - the Wisconsin glaciation stopped just north of the Ohio River - but there is a small amount of glacial outwash (gravel) in the very northern part of the region. The Inner Bluegrass is the richest, most productive region in the Bluegrass or Nashville Basin. The level to rolling terrain contains extensive karst, droughty intermittent streams and deeply dissected river gorges along the Kentucky and Dix Rivers. The underlying rock is almost entirely Ordovician limestone, with the thick Lexington Limestone lying atop deeper layers of limestone to a depth of at least 4,000 feet. 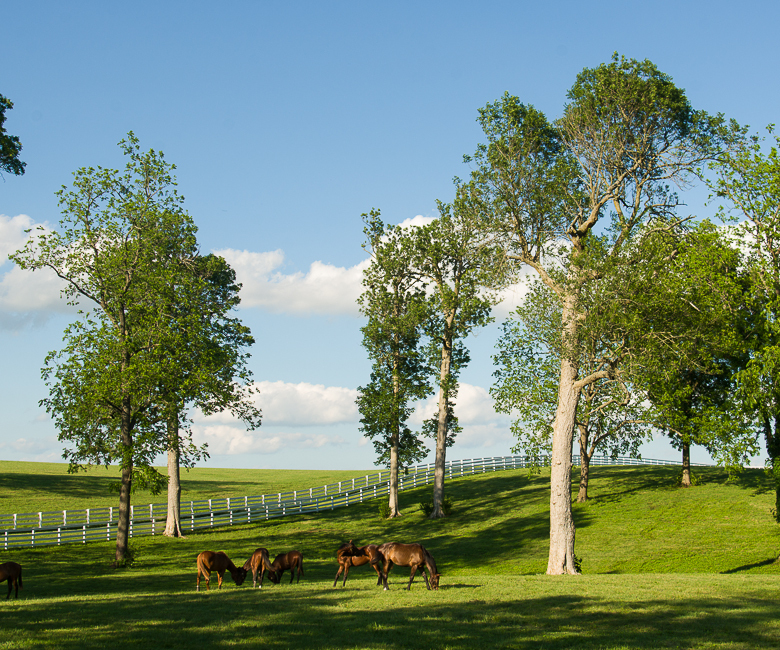 The Inner Bluegrass is home to the famous Horse Country, with some of the richest and most nutritious pasture land in the world. Horse and cattle farming are the dominant agricultural land use. Frequent drought in the excessively drained karst topography makes it difficult to grow crops, although tobacco was formerly an important cash crop. The Inner Bluegrass is the most urbanized area in the Bluegrass, with Lexington occupying about 1/4 of the land. Strict land use regulations in Fayette County have prevented the city from completely consuming the farm land. Today there is an emerald necklace of horse farms around urban Lexington protected by land use regulations and conservation easements. Extensive woodland pastures are found in all the Inner Bluegrass counties. The Hills of the Bluegrass are also called the Eden Shales. It is easy to see when you have traveled from the Inner Bluegrass to the Hills of the Bluegrass. Abruptly, the horse farms and woodland pastures disappear, to be replaced by scrubby forests of hardwoods and eastern redcedar. The reason? Geology. Instead of the the nearly level Lexington Limestone, the rocks of the Hills of the Bluegrass are a mixture of calcareous shale, fine siltstone and limestone. Soils are high in phosphorus like the Inner Bluegrass but the fertility is remarkably lower. The terrain is steeper, with rolling hills. Most of the region was farmed by subsistence farmers, with none of the grand estates of the Inner Bluegrass. The thin soils could not withstand the poor farming practices of farmers, and erosion reduced the productivity of the land. Most of the farm land of the Hills of the Bluegrass was abandoned. Eastern redcedar quickly took over pastureland, soon followed by hardwoods, especially oak. The Outer Bluegrass consists of rolling hills, with the landscape often more dissected than the Inner Bluegrass. Slopes are steeper and valleys deeper than in the Inner Bluegrass. The Outer Bluegrass is mostly farmland except for the heavily urbanized areas around Louisville and Cincinnati. The farmland is primarily pasture, but the more dissected terrain discourages horse farming. Most of the farms are in cattle rather than horses. Woodland pastures are found scattered throughout the region. Although the soils of the Inner Bluegrass developed entirely on limestone, the interbedding of shale and limestone in the Outer Bluegrass create a more complex mosaic of soil types. The Bluegrass is perched on a dome of limestone, called the Lexington Dome. The limestone formed in shallow seas during the Ordovician Period, 485-443 million years ago. The Bluegrass is surrounded by younger rock through which the dome rose. The Inner Bluegrass is nearly pure Ordovician limestone, while the Hills of the Bluegrass and Outer Bluegrass are dominated by limestone with outcrops of shale. Limestone slowly dissolves as rain percolates through the rock. This creates a condition known as karst, in reference to the Karst Plateau of Slovenia and Northern Italy. Rain slowly dissolves the rock, creating cracks, fissures, sinkholes and caves. The many famous caves of Kentucky, including Mammoth Cave and Carter Caves, are in these limestone formations, although outside of the Bluegrass. There are numerous small caves in the Inner Bluegrass and the Inner Nashville Basin. The sinkholes of the Inner Bluegrass are one of the dominant features of the pasture landscape, and are found to a lesser extent in the Outer Bluegrass. Limestone is quarried throughout the Bluegrass. In spite of our abundant rainfall, our streams often dry up quickly after rain, and pastures become very dry. Karst allows rain or melting snow to percolate quickly through the soil into the underlying rock. Instead of forest and crops, the Inner Bluegrass and Outer Bluegrass is dominated by grasslands. Our trees are very drought tolerant and often rooted very deeply. Bluegrass karst. Blue is carbonate (limestone) karst. Note the relative lack of karst in the Hills of the Bluegrass. The Bluegrass has been a premier agricultural area of the eastern US since it was first settled in the late 1700s. The wide-open groves of trees interspersed with cane and forest were immensely attractive to settlers because they could begin farming with minimal land clearance. 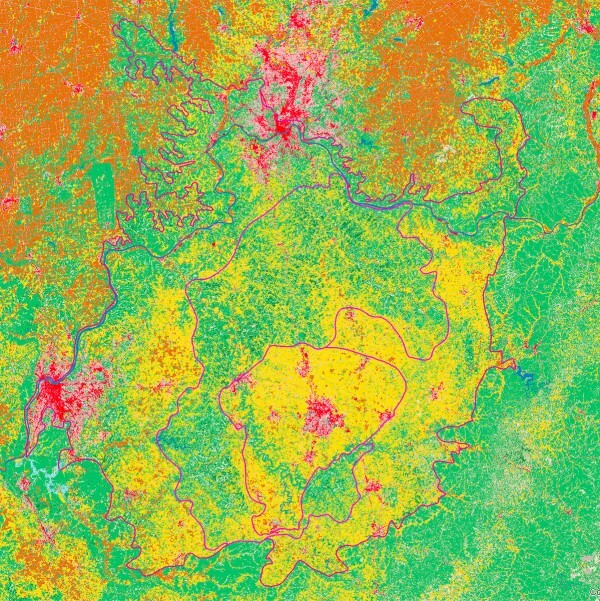 The land cover of the Bluegrass today reflects its importance for agriculture and its increasing urbanization. The Inner Bluegrass is predominantly urban and pasture, with limited row and field crops. The predominant pasture use is grazing for horses and cattle. Substantial groves of venerable trees are found in the Inner Bluegrass around farm homes and in pastures. In the urbanized Inner Bluegrass, Venerable Trees occur mostly as scattered individuals. 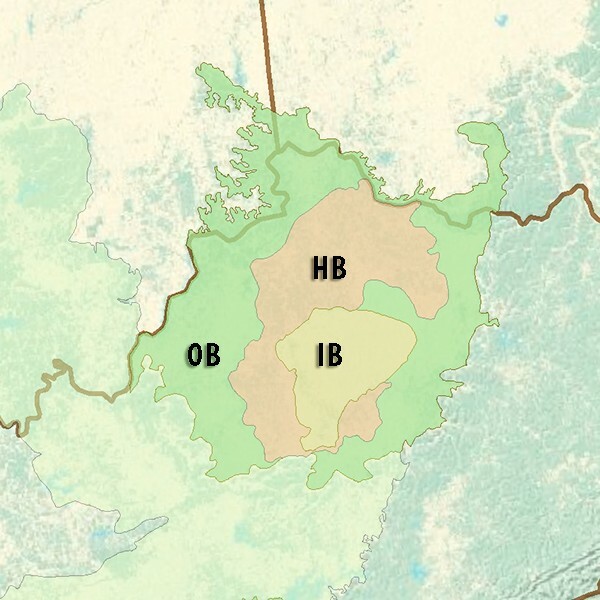 The Hills of the Bluegrass are less fertile than the Inner Bluegrass and this is reflected in the greater forest coverage. This forest cover is entirely early-successional forest that has become established after the abandonment of less desirable farmland over the last 100 years. Very few Venerable Trees are found in the forest areas, but there are scattered individuals, some of them of great age.